This is a two-component epoxy repair material for plastics. 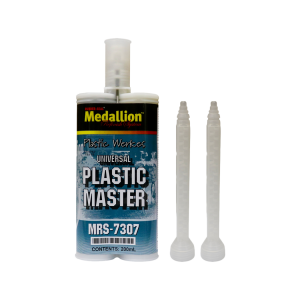 It has excellent adhesion to most plastic including TPO and polypropylene when used according to the Medallion™ repair process. It provides an outstanding featheredge that resists lifting and balling up when sanded. Sandable in 15-20 minutes. It is an excellent repair material for single and two-sided plastic repairs and has excellent sanding characteristics.